Inspired by what she sees, eats, cooks and experiences as a local in the heart of Barcelona, Australian-born Sophie Ruggles brings to life this vibrant city with her colourful collection of recipes, stories and images. Sophie shares her quirky insights and personal cooking touches, as well as her understanding of the heartwarming and approachable local cuisine that made her fall in love with the place and its food in My Barcelona Kitchen. INCLUDED ARE USFUL TIPS ON LOCAL INGREDIENTS AND COOKING METHODS TO HELP OUTSIDERS NAGEGATE THEIR WAY THROUGH THE MOT TRADITIONAL SPANISH RECIPES. DISCOVER A LIVEL, DIVERSE CITY AND HAVE AN AUTHENTIC EXPERIENCE IN YOUR OWN HOME KITCHEN WITH MY BARCELONA KITCHEN. No knife skills, can´t boil an egg, never cooked a thing in your life – no worries, help is in your hands! Leaving the family home, getting married, becoming a new parent, looking after a sick spouse, finding yourself suddenly single; these are just a few life scenarios that will often require a crash course in cooking. Inside this book you will discover all the information you need to kick start your kitchen and make all your favourite meals regardless of your level of experience. 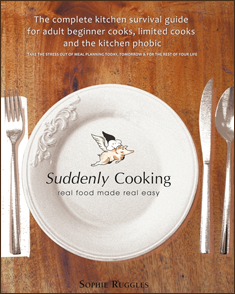 Of the 120 easy to prepare recipes on offer, over two thirds can be made and on the table in under 30 minutes. Each recipe indicates whether it is vegetarian or gluten free and there are dozens of leftover makeover ideas to help you make the most of every meal. Make your kitchen cooking friendly and stock up on essential equipment and utensils, take the sting out cooking and throw out those band-aids and antiseptic cream by learning how to chop using the fully illustrated tutorials in chapter one. And if you can´t tell an eggplant from an aubergine then the pictorial food dictionary can help you identify all the ingredients used in these recipes and many more. Putting food on the table day after day no longer need be a chore. You can learn to cook great food without stress – even if you don´t know it yet.